1.Loosen the outer screws, flatten the inner hoop, place the cloth on the hoop, and place the outer hoop on the inner hoop. 2.Flat the cloth and tighten the screw. 3.Continue to flat the cloth, to ensure that no pleats, and pay attention to the fabric so that the warp and the vertical and horizontal edge, and finally tighten the screws. 4.Check the hoop is tight enough. The method of checking the tightness is to use a needle having a thread through the surface of the fabric. This is possible if there is an explosion sound when the cable is pulled. 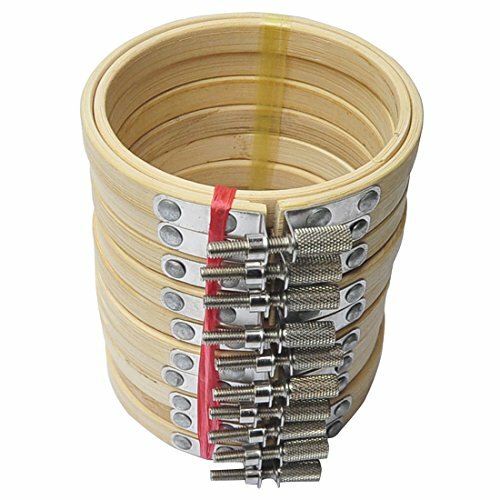 1.This 3 inch(8cm) specifications of the product is processed with a bamboo into a circle, so there will be small cracks, but does not affect the use. If you have any questions about this product by Ivinxy, contact us by completing and submitting the form below. If you are looking for a specif part number, please include it with your message.